Adress : Jalan Bulan, Off Jalan Bukit Bintang , 55100 Kuala Lumpur, Malaysia. A contemporary and award-winning gem in the very centre of bustling Bukit Bintang makes the Capitol Hotel a firm favourite for many of its loyal fans. 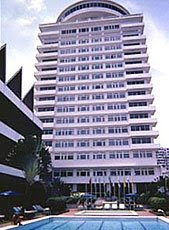 Capitol Hotel Kuala Lumpur is located in the heart of Bukit Bintang Shopping Belt and Business District. The hotel is just a stroll away from one of the best fashionable shopping districts located at the heart of the "Golden Triangle Area of Kuala Lumpur". The Hotel is located next to Sungai Wang Plaza Shopping Centre, Bukit Bintang Plaza Shopping Centre and Low Yat Plaza Shopping Centre. The Hotel is characterized by its elegant simplicity with 225 rooms of unexpected luxury and modern conveniences to cater to your needs. All of the guest rooms are comfortable and nicely equipped to give a feeling of relaxed luxury. The hotel has been uniquely designed to provide everything one could possibly need or desire. Guests can enjoy dazzling views of the Kuala Lumpur skyline from the rooms. You can experience good food and enjoy music while dining in the elegant surroundings of the Be Be's Kitchen and Bar, as well as Cafe Rasa. The Hotel provides guests with a comprehensive service centre called "One Stop" that combines the services of the concierge, front desk, room service and other services that are required. The hotel also provides meeting, conference and banquet facilities for all your business and private functions.